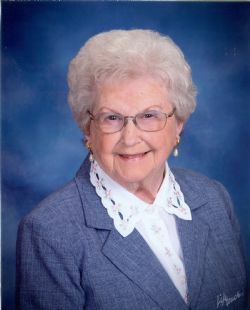 Lola Mae Denison went home to be with her Lord on Sunday, January 27, 2019 at the University of Nebraska Medical Center, Omaha, NE. following complications of a stroke. Lola Mae was born May 17, 1932 on the family farm east of Winslow, to Louis and Bessie (Barnhart) Wolf. She was baptized May 29, 1932 at her home and because of the illness of the pastor, Ernest Eckhardt of Immanuel, Lola Mae was baptized by Pastor J.H. Gerdes of St. Paul’s Lutheran Church, Winslow, Nebraska. She attended District #14 Wolf School, Immanuel Lutheran Parochial School and was confirmed March 25, 1945 by Pastor Eckhardt. She graduated from Hooper High School in 1949. She had been employed at the Mode O’ Day dress factory and later at the Dodge County Assessor’s Office. She then was a faithful farmer’s wife and a stay at home mom for her four children. She was a member of Immanuel Lutheran Church where she married William “Bill” Denison on October 19, 1949. They farmed east of Winslow until retirement. She was a member of the Immanuel Ladies Aid and held several offices. She and her husband were faithful members of the choir. They were caretakers of the Immanuel cemetery for many years. She was a former member of the Merry Mrs. Club and the Tower View Club. She taught herself how to crochet and enjoyed making many afghans, baby afghans, potholders, rugs and lap robes for her family and friends. They built a retirement home at Orange Blossom Gardens in Florida which was later renamed The Villages of Lady Lake, and spent their winters there moving permanently in 1992. Bill passed away January 2, 1993. Lola Mae enjoyed making many new friends, enjoyed golfing, bowling, and many other activities. She and her friend, Jeannie Weber began the Wild Bunch golfing league which is still going strong. She went faithfully each week to Operation Shoebox, an organization that ships care packages to troops overseas. She became a member of Bethany Lutheran Church in Leesburg, Florida and in 1996 a new congregation was established in Summerfield, Florida of which she was a charter member and organist for the first seven years of the church’s existence. She moved back to Nebraska on January 27, 2010 and had since lived in Fremont. She is survived by daughters, Carol (Tom) Karlin of Beatrice, Joyce (Bud) Foust of Hooper; Sons, Robert (Donna) Denison of Fremont and Daniel (Terri) Denison of Omaha. She was blessed with 11 grandchildren and 26 great-grandchildren. Julie (Matt) Sleister, Matthew, Riley, Katie and Sam. J.T. (Alysia) Karlin, Bryce and Cole; Justin (Erica) Karlin, Austin, Jacob and Ainsley. Joshua Denison, Hilary Denison (fiancé Mat Goudy), Shayleigh and Tucker Danielson, Lola and Kouper Goudy, Alyson Denison, Ross (Annie) Denison, Sybil Porter, Peirson and Ashton, Zachary Steenblock, Brenda (Chris) Gale, Collin, Bria and Carissa; Joe (April) Foust, Alex, Chance, Marcus and William and Brad (Shannon) Foust, Isaac, Kaden and Karson. Two step-children Heather (Chris) Smith, Taylor, Katie, Ben and Luke Railey, Addie and Payton Smith; Corby (Heidi) Weaver, Jake and Payton. She is also survived by one sister-in-law Marian (Midge) Wolf of Fremont. Preceding her in death were her husband, Bill; her parents; two brothers, Berkley and Lyle Wolf, her mother and father-in-law; a brother-in-law; 3 sisters-in-law, a nephew and a niece.